So ironic, but so true. If I take my mind off of myself and get myself out of the way (my expectations, my ego, my ambitions), I have a better shot at being happy….or rather content. There’s a difference. I’ve found that happiness is very short lived and relies on the situation — the stuff that’s out of our control. Contentment is the goal, not happiness. And from my own experience, contentment is found in living in the moment, seeing what’s before me — right in front of me — and reacting with compassion. Living in the here and now, presently. There I can sense an inner peace that leads to contentment. I slow down and smell the roses or the coffee or whatever’s in the air that particular moment. 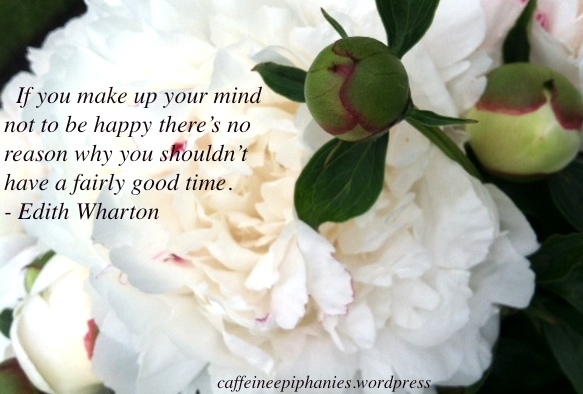 Edith Wharton’s words, make up your mind not to be happy, for some strange reason make me smile. More irony! So, there must be a grain of truth in there somewhere. Wonderful quote and full of truth. I just put down Edith Wharton’s “The Reef” to check my email and I clicked onto your site. I had been thinking it was not withstanding the passage of time as well as her other novels, when the conflict started to thicken and I was becoming fully engaged. Anyway, regarding the quest for happiness, any philosphically minded person knows that searching is the last way to find it. Edith Wharton had a tough start in life, as far as happiness goes….is that what makes writers so good? Must one suffer a bit in order to have compassion for others? love your blog. thanks for stopping in on mine. I think you’re right. A good writer writes about what they know. She knew disappointment. I sometimes wonder if she ever got over her first (broken) engagement to Harry Stevens. He called it off and from what I’ve read, she was completely unaffected outwardly. But…who knows what was really going on inside. Thanks for commenting!